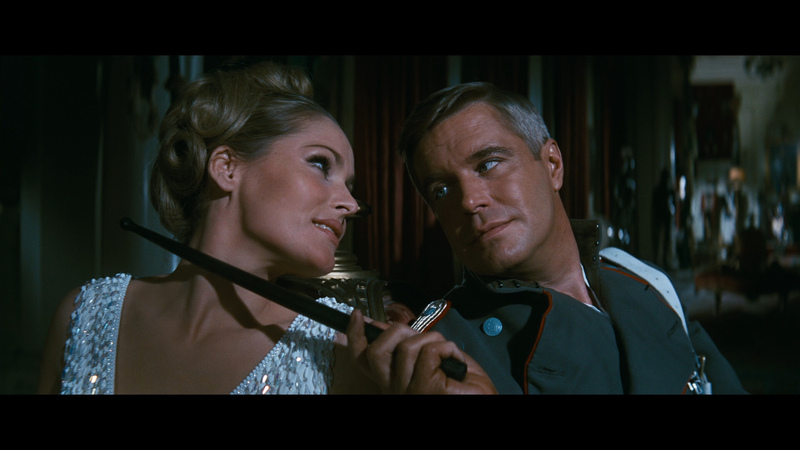 Description: Directed by John Guillermin and starring George Peppard, James Mason, and Ursula Andress, The Blue Max (1966) is based on Jack D. Hunter’s perennial best-seller about an ambitious young German soldier (Peppard) who, from the muck of the World War I trenches, becomes determined to join the aristocratic ranks of his country’s heroic fliers. 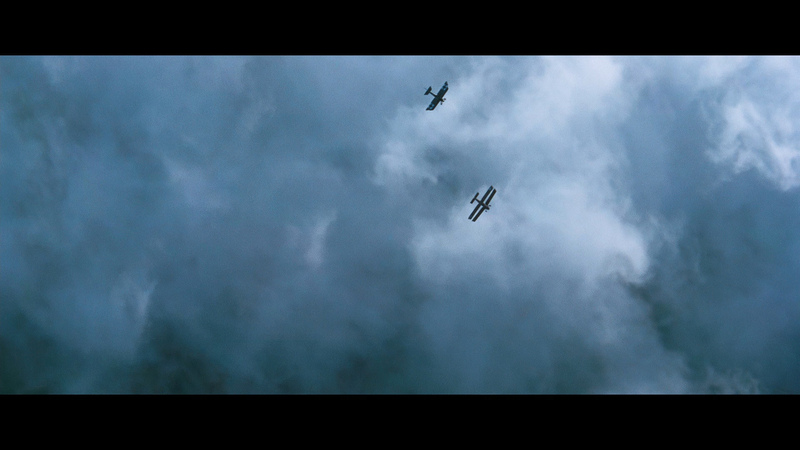 The film details his journey as he moves up the ladder and into the skies, providing along the way some of the most thrilling sequences of aerial combat ever committed to the screen. Featuring music by Jerry Goldsmith (available on this Twilight Time release as an isolated track) that has taken its place as one of the greatest film scores of all time. 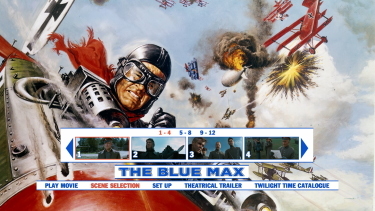 Based on a novel by Jack D. Hunter, The Blue Max is a World War I aviation drama, told from the German point of view. 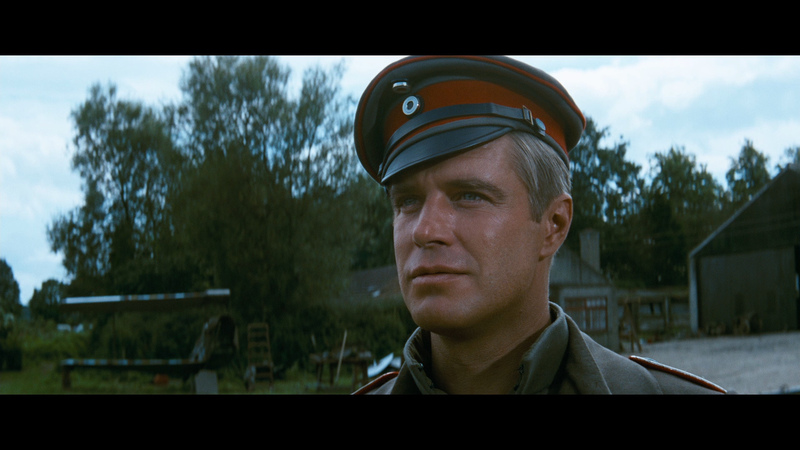 Low-born infantryman George Peppard becomes a pilot, almost deliberately stepping on the sensibilities of his aristocratic comrades in the process. 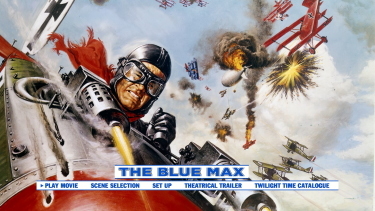 A national hero, Peppard wins the Blue Max, the highest award that can be bestowed upon an aviator. 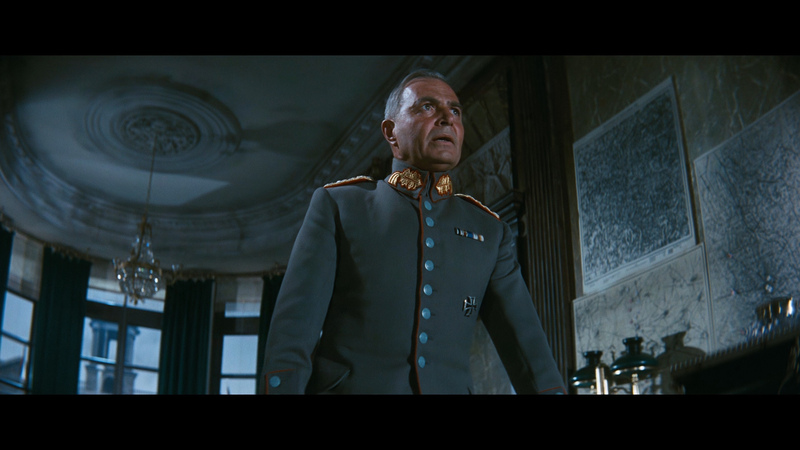 His fame is exploited by general James Mason, who tolerates Peppard's affair with Mason's wife Ursula Andress. 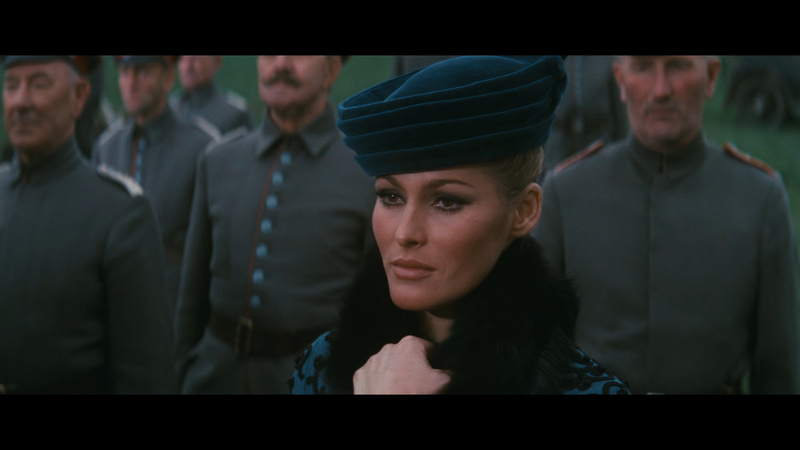 The canny Mason knows that, eventually, Peppard will be expendable, and a "heroic" death can be arranged. Perhaps the best film ever made about World War One fighter pilots — certainly the best ever shot in color. 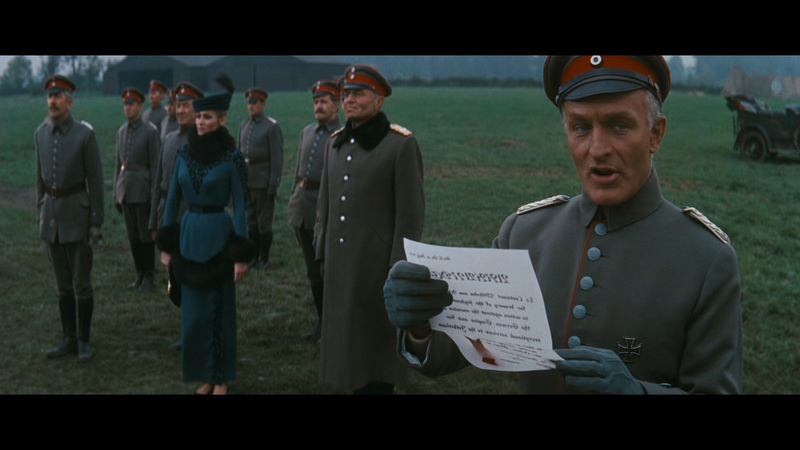 It's also the only one that I'm aware of to focus exclusively on the German side. Spring, 1918. 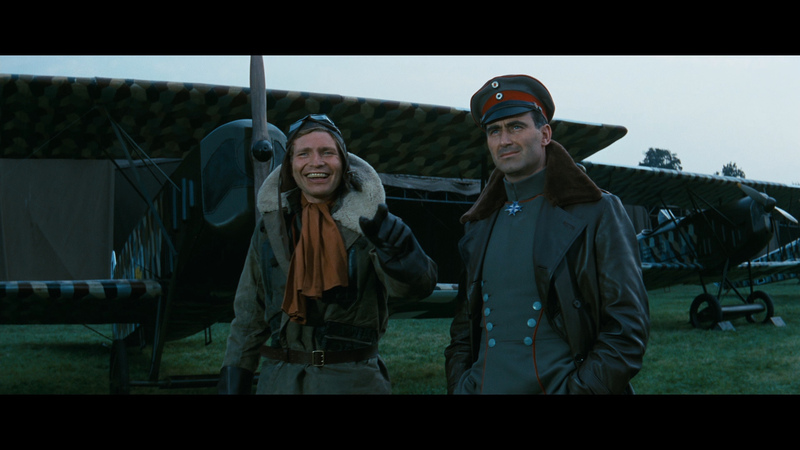 Freshly graduated from flying school, Lt. Bruno Stachel (George Peppard, best known to the world as the leader of TV's The A-Team) is posted to a fighter squadron on the Western Front. 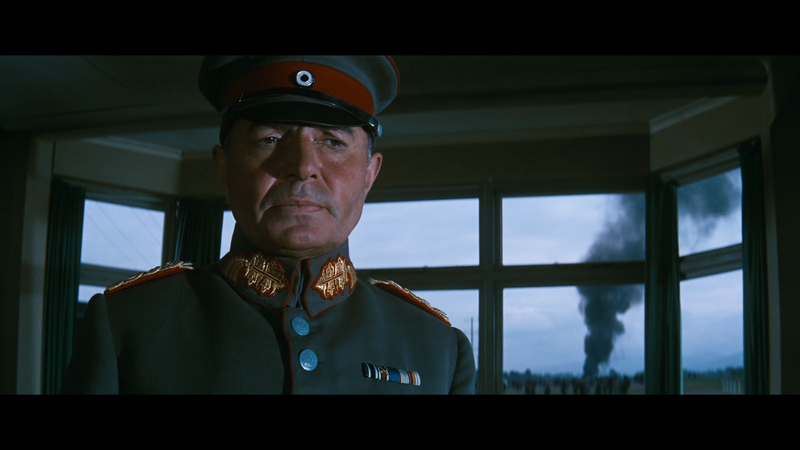 His background makes him quite different from the other pilots of Jasta 11. Whereas they are the sons of the nobility and landed gentry (many with "von" before their surname), Stachel hails from the lower classes — "common as dirt." He's also an infantry veteran, having survived battles in the trenches to gain a merit promotion to officer rank. Life in the Air Corps proves very different from his experience as a rifle-toting grunt. Instead of sleeping in the mud he now has his own private room. Alcohol flows freely from the fully stocked bar in the officers' mess, where pilots toast each other's victories with vintage champagne. 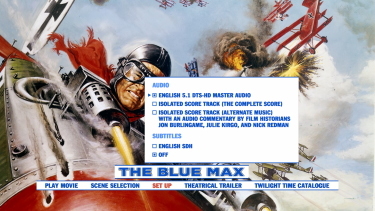 The Twilight Time Blu-ray of The Blue Max looks quite good. 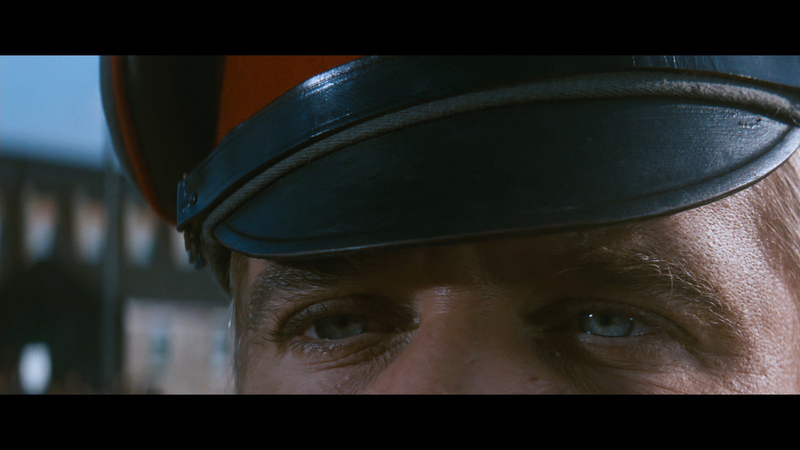 This is dual-layered with a supportive bitrate - and from a strong, damage-free, source. Contrast has some nice layering and the visuals seem fairly tight. There is pleasing grain and even some depth exported. 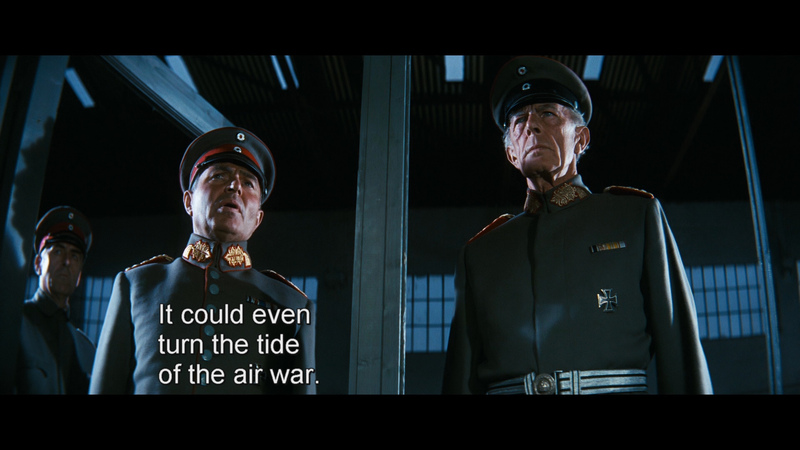 The impressive air battles and cinematography really lend themselves to the higher resolution. It may have some teal-leaning and a bit of gloss - but neither deterred by viewing experience. Not much damage or speckles are visible. I noticed no compression artifacts and it is very smooth in-motion. The Blu-ray is fairly strong with no major flaws - it gave me a solid 1080P presentation that I appreciated as I watched some of the film's aviation camera angles. Twilight Time use a DTS-HD Master 5.1 track at 2299 kbps. 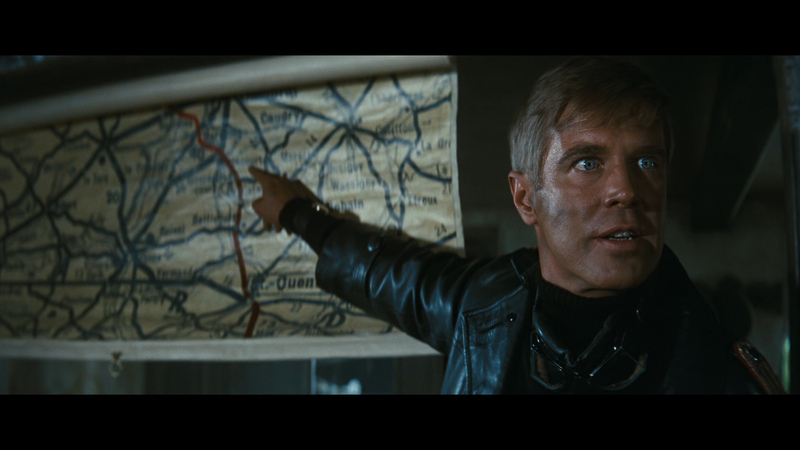 This is kind of a compromise from the original 6-Track Stereo / 4-Track Stereo used in the film. It sounds solid - great airplane separations and the score by the prolific Jerry Goldsmith (Seven Days in May, Lonely Are the Brave, Planet of the Apes, The Satan Bug, Fate is the Hunter) sounds very tight and uplifting via the uncompressed. There are optional English subtitles (sample above) and my Oppo has identified it as being a region FREE. Twilight Time add their usual isolated score - this is Jerry Goldsmith's complete score and sounds wonderful DTS-HD Master, As well as a trailer they add a second audio track - it is an engaging commentary by film historians Jon Burlingame, Julie Kirgo and Nick Redman - each complimenting the other's knowledge base and adding excellent information on Goldsmith, the book, the production, Peppard's career etc. . Now I should state that this commentary has three gaps - this is for 3 alternate musical cues (also by Goldsmith) - the commentators stop talking. Fabulous discussion and there is also an 8-page liner notes with essay. 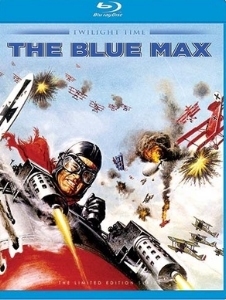 The Blue Max is a great film. 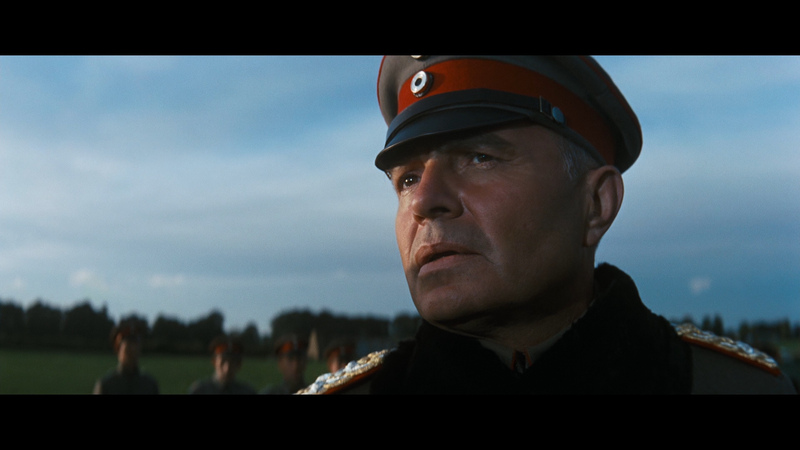 As far as War film go - this is one of the best (and that's saying a lot.) It shows the glory and reality of the business of war. 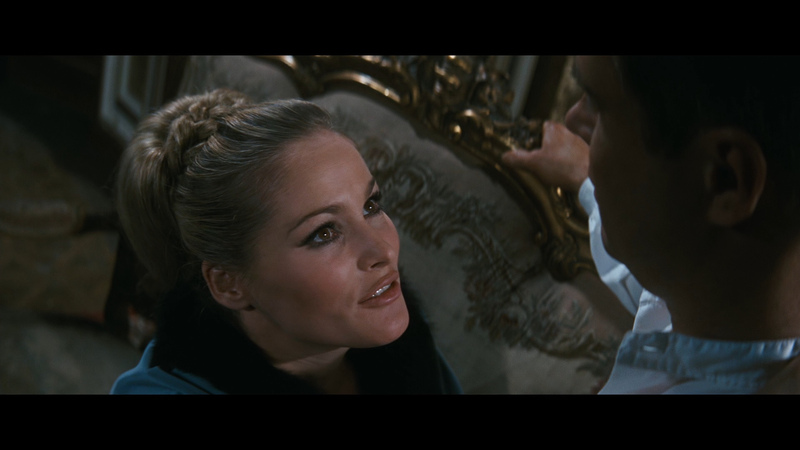 I hadn't seen it for years but it came back quite quickly with Peppard's great, unlikeable, performance although many of the highlights take place in the air. I think this was a super Blu-ray choice for Twilight Time and I love they add in such a professional commentary. I appreciated that I could see it in 1080P. We'd like to strongly recommend this!